Datadog is designed to help app developers, IT professionals, and other app operations specialists to monitor the performance of their apps, tools, and services, gather data from scattered sources, and turn them into detailed and reliable insights. From there, users can produce sound strategies for their apps and tools, create better applications, and improve their services. Datadog comes pre-integrated with leading third-party business applications and integrations, enabling seamless workflow for many users regardless of platform, geographical position, and language. Connect and compare metrics and other data from all apps and services as well as information coming from Amazon EC2, web servers, StatsD, SQL and NoSQL databases. Streamline information analysis and other related processes such as graphing and measuring in a matter of seconds, not minutes. Configure information filtration setup to only gather the metrics you need. Tweak the system to send alerts or notifications on issues that only require your immediate attention. Focus on the correct code configurations, significant updates, and scheduled operations. Extensive collaboration features enable you and your team to work hand in hand and provide comment and annotations for a productive session. Since each organization has unique business wants, it is sensible for them to refrain from looking for a one-size-fits-all faultless software application. Needless to say, it would be useless to try to find such a platform even among popular software platforms. The clever thing to do would be to list the various vital aspects that need consideration such as main features, budget, skill levels of staff members, company size etc. Then, you should do your research thoroughly. Read some Datadog reviews and check out each of the other apps in your shortlist in detail. Such comprehensive homework can ensure you weed out ill-fitting platforms and select the solution that offers all the features you require for business success. How Much Does Datadog Cost? We realize that when you make a decision to buy Business Intelligence Software it’s important not only to see how experts evaluate it in their reviews, but also to find out if the real people and companies that buy it are actually satisfied with the product. That’s why we’ve created our behavior-based Customer Satisfaction Algorithm™ that gathers customer reviews, comments and Datadog reviews across a wide range of social media sites. The data is then presented in an easy to digest form showing how many people had positive and negative experience with Datadog. With that information at hand you should be equipped to make an informed buying decision that you won’t regret. Offers versatility. It'd be nice if it came with support for wallboard. A product that's easy on users. What are Datadog pricing details? What integrations are available for Datadog? Pros: Our current app uses so much data that we never thought we could 'pack' everything under the same roof. When Datadog joined our team-we did! We track all metrics easily, especially satisifed with the eye-pleasant interface and the perfect timing. 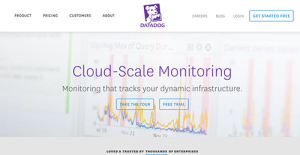 Our overall opinion is that Datadog is a great tool, and it is useful in every situation. Cons: I had quite a tough list of requests and expectations, and I was ashamed of even challenging Datadog to deal with them. Therefore, I have nothing to criticize about this program. Pros: To start with, I like the flexibility of the monitor, it is integrated with more than 100 services, which theoretically means you can track everything! Checks the health of the server, and enables creation of personalized dashboards where you mix all sorts of data without confusing the program. I also like the custom tracking stats, since there are new generation's APIs where you build the desired gauges and stats to measure even uncommon matrics. Futuristic, ain't it? Cons: The learning curve is demanding, especially to those who wish to master every matric, service, or measurement process. Be careful what you wish for, it is an unexplored ocean what you're diving in! In technical terms, I'd mention few bugs and scratches I picked up on the go, my research has not been that intense to discover serious cons. Let's say that some alerts are not functional, and integration with some important services is too simple and trivial. Finally, if you don't know what you're about to do with it, don't take it. It requires a plan. Flexibility at its finest. It's capable of tracking just about any metric out there. Great dashboad functionality. Dashboards can easily be shared. Setup was easy. The UI is simple and clean. User-friendly in a lot of ways. If you had expereience of StatsD/Grafana then you'll be glad how easy this can be. Setup was easy in this thing. Simple setup and usage of dashboard service.